Our benches and tables are made of eastern white cedar. White cedar has a natural tannic acid that protects the wood from rot and decay similar to cypress, redwood or western red cedar. Cedar may develop checks or small cracks, which is typical of the drying process. Checking may occur no matter the quality of lumber and will not affect the durability of the end product. Cedar will turn silver gray over time. The further south you go the faster this happens. To many of our customers, this is a desired “natural” feature of cedar. Little to no maintenance is required if you wish your benching to gray out. Should you change your mind later, you can follow the coating manufacturer’s instructions on surface preparation before finish. Because cedar readily accepts stains or paint, we recommend the use of semi-transparent deck stains. An outdoor stain with some solids, light protection, and mildew/algae protection will give you the best coverage. Too many solids (color) and you will not see the wood grain and features. No protection and the wood will discolor. When using different manufacturer’s stains, you must read the instructions carefully regarding the preparation of the wood surface. Drying is the critical feature of the effectiveness for many products. Much of our benching is built and shipped in the winter and early spring before the wood is properly dried. It may still be frozen. The first step for some stains is to dry the benches properly. This is best done in a heated building or greenhouse with fans to move air across the bench surfaces for several days. 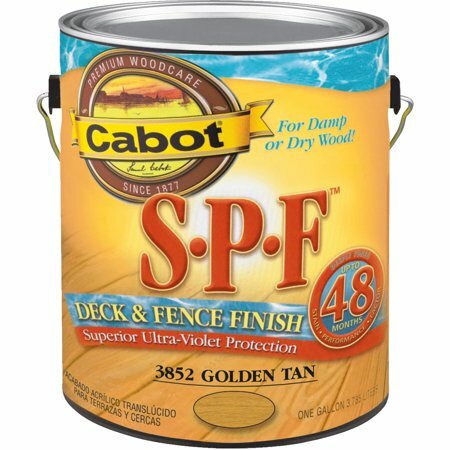 In 2006, Cabot Stains came out with a new product line – SPF Deck & Fence Finish that can be applied effectively on wet surfaces. 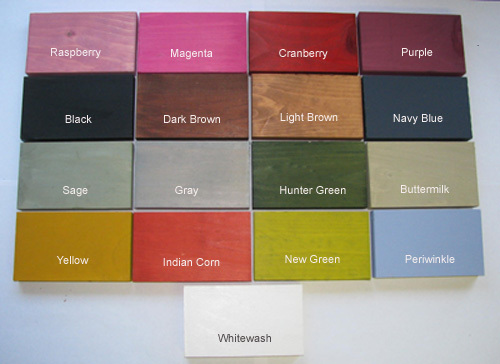 Our customers have used Cabot semi-transparent stains effectively for several years. We currently recommend, and use for our own finishing purposes, #3852. It can be sprayed, brushed, or rolled on. Two coats are recommended – especially on the top surface of benches. Cabot Stain Finish should last 48 months. Normal garden center usage is really hard on finishes – especially outside so If you notice discoloration, algae or mildew building up, we suggest a good cleaning and refinishing. Wooden benching can be cleaned with deck cleaning compounds and power washing. Deckwood, Behr & Cabot have products that come well recommended. They are sprayed or brushed on and power washed off. Bleach solutions work well, but too much bleach is hard on the wood.